The essential safety supplies inside a military grade aluminum LED flashlight keep adventurers prepared. On wilderness adventures, you want to be thinking, "The Earth's magnificence is beyond human comprehension," not "Did I forget the matches?" This kit contains the safety supplies you need for short-term excursions, cleverly stashed in a military grade aluminum LED flashlight. 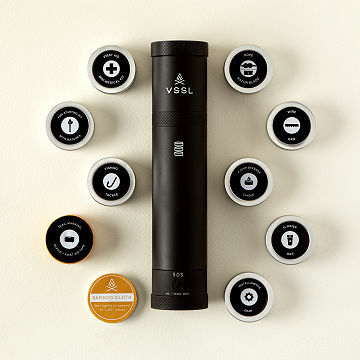 The impeccably crafted itemsincluding water purification tablets, a compass, a wire saw, reflective trail markers, and yes, waterproof matchesare packed in small canisters that fit perfectly into the flashlight tube. Chuck it in your bag or glove box, and be prepared...to never again be plagued by distracting worries in the wilderness. A handy, and maybe even lifesaving, gift for hikers and campers. Made in Canada.